They were also charged with securities fraud over the bond sale, according to a statement issued to the press by a state prosecutor. Ressa’s lawyer declined to comment on the fresh cases when contacted by AFP. According to the same report, “Ressa insists the site is not anti-Duterte, saying it is just doing its job to hold the government to account.” However other media reports evidently contradict this claim. 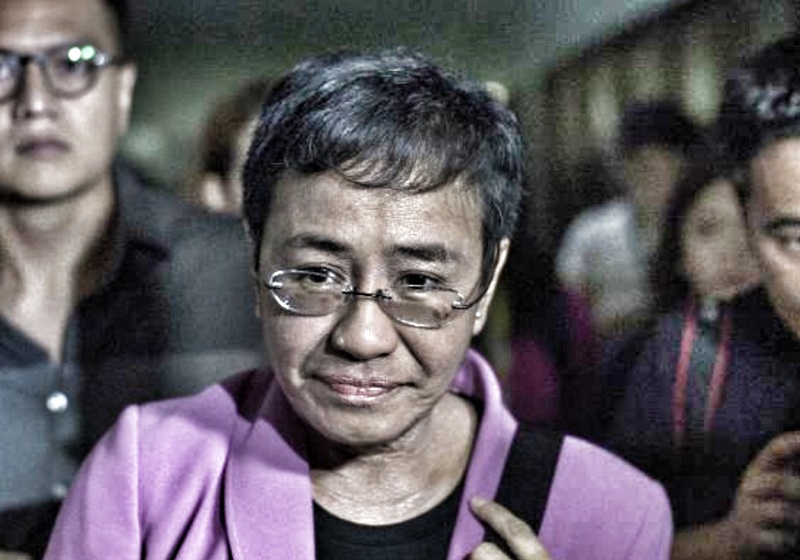 A recent Bloomberg report describes Ressa as “[the] head of a Philippine news site critical of President Rodrigo Duterte”, suggesting that publishing “news” reports critical of Duterte had come to be known as an inherent feature of the corporate character of Rappler. While the other big media conglomerates operating in the Philippines led by ABS-CBN, the GMA Network, and the Inquirer Group have all been at one time or another cited for being “biased” in their reporting and in the manner that they prioritise display and profile of their published and broadcast content, it is only Rappler that had made just short of categorically explicit its mission of being critical of the Duterte government or, as most would assert, of any partisan group critical of the Aquino-Cojuangco clan and its broader community of “Yellowtards”. As the Bloomberg report makes quite evident, this particular character of the Rappler brand has been picked up and consistently highlighted by Ressa’s cronies in foreign media. It is likely that Rappler has long suffered from two erstwhile “assets” that had evolved into abject liabilities. Firstly, it Rappler once took pride in its newsroom staffed by young hipster writers and producers collectively pitched as a new generation of “media practitioners” out to disrupt the status quo blanketing “mainstream” or “traditional” media. In time, the starker character of this lot of “reporters” who consistently tended to err on the side of reactive emotionalism than on level-headed, facts-based, and coherent journalism became more evident. Second, its early approach of deliberately blurring the line that sets apart real journalists who practice the trade professionally and the community of online publishers broadly defined as “citizen journalists”, while once hailed as an innovative asset within its brand equity, has, in recent months, become the bane of its existence. In short, Rappler is a failed industry “disruptor”. Rather than lead in the redefinition of an entire industry it, instead, became a blight on it, infecting the entire landscape with its degenerate practice of the once-noble profession of journalism. Indeed, in light of recent events, even the best of successful disruptors have come to be regarded with disdain. That seminal big-time disruptor of the Net that came of age in the mid-2000s, Facebook, now too finds itself staring down the business ends of global regulators’ guns after having enjoyed more than a decade of gleefully turning its mainstream competitors’ business models into minced meat. But, unlike Facebook, Rappler is a mere cockroach that could easily be crushed and scraped off the sole of one’s shoe straight into the crapper. It is a failed business that, by many accounts, never turned a profit, never remained sustainably cash-positive, and never delivered any capital gains of consequence to its investors and shareholders. In short, as a business, it is a dud. As such, as its “CEO”, Ressa has failed the Rappler business. So, is Rappler worth saving? The answer to that question has become quite obvious. It is a liability to the journalism profession and it is a liability to its shareholders. And its CEO, Maria Ressa has become no more than a sad punchline. “Opposition” blogs for the last three years have this victim complex, some of them blamed Duterte and his “hackers” for trying to shut them down last December with no technical proof other than some political cartoon showing them are brave freedom fighters against a dictator. Same is said when they hide the tax-evasion and libel case against Rappler and just say it’s political repression, if they cannot defend against the tax-evasion and libel case against Rappler and are just playing armchair activist and internet lawyer, then they’re standing firm in sinking sand. Rappler from the beginning was there to “put lipstick on a pig”. Their goal for their first 4 years was to give the illusion that a complete inexperienced, unaccomplished and lazy imbecile was a competent, confident and capable head of state. Oh yes they have their cult following of apologists who cry persecution. Just as they are never complimentary of the current president , they also view the previous president and his allies as a posse without sin. So they cast the first stone to Duterte and the second and the third. Pontius Pilate was famously accountable to what he wrote. Maria Ressa by saying that she is not anti Duterte ( nor did she claim she is pro Noynoy) despite what we all is there after 7 years of their articles is not accountable for what is there. Well I was born at night but not last night. She can’t even evaluate her publication at face value so why should we? The noisy anti PDD love Rappler and rally behind them claiming political prosecution. Well they are the same people that historically rally behind the aforementioned imbecile. Who also claims that he himself is without sin and blames everybody else. They are a match made in heaven actually. Maria Reesa, and her Rappler.com propagandists are now abandoned by their political patrons. They are no longer in power…so, she and her Rappler.com; either “sink or swim” to defend themselves of the charges filed against them by the government. They hope that their equally biased foreign media cahoots, will come to their rescue. Or at least, remove Pres. Duterte from office, and replace him with that, imbecile woman, Fake VP Lugaw Robredo ! patrimonial assets, the money stolen by the yellows isn’t it patrimonial assets too? at least we know where it’s going water for pilipino people. Man, or at least criminal man, has lost all enterprise and originality. As to ones’ own little practice, it seems to be degenerating into an agency for recovering lost lead pencils and giving advice to young ladies from boarding-schools. And Rappler did perfectly just that.